Only a few Legs to go! 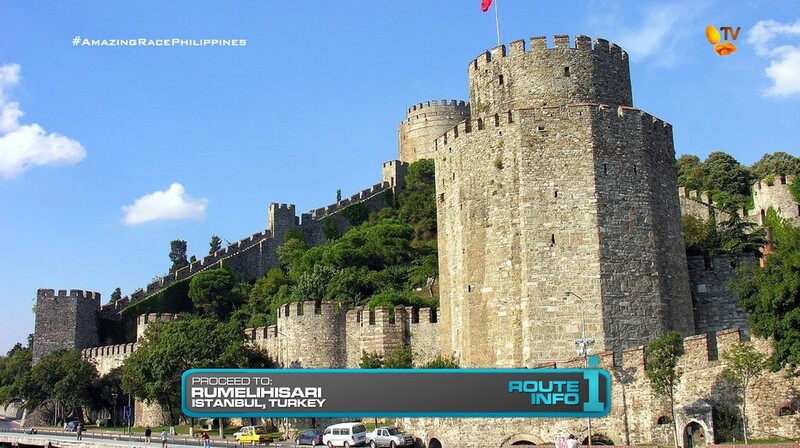 But first, teams must set out on the 9th Leg of the Race where they will be flying to Istanbul, Turkey! 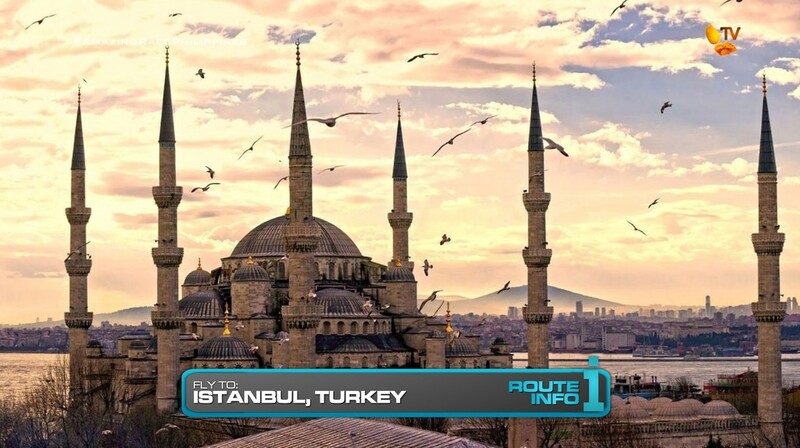 Arriving at 11am on Turkish Airlines, teams must immediately head to the Ayasofya Hurrem Sultan Hamami for their next clue. Here at this traditional and opulent Turkish bathhouse, teams must scrub each other with a provided bar of soap until it reveals their clue, a picture of the Hagia Sophia. 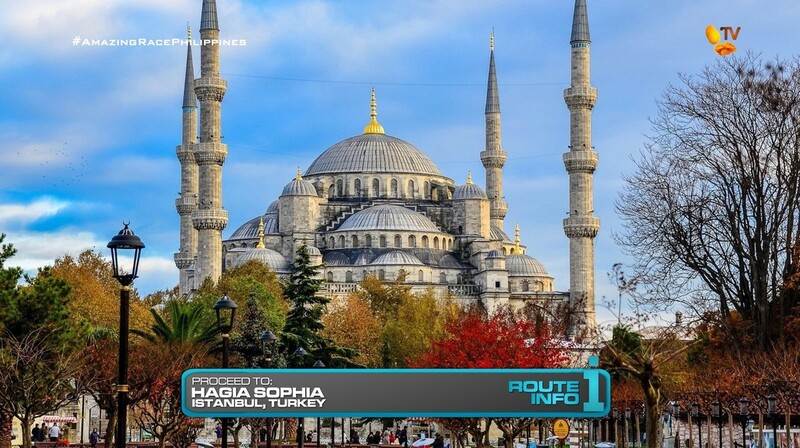 Teams must make their way on foot to the Hagia Sofia for the next clue. 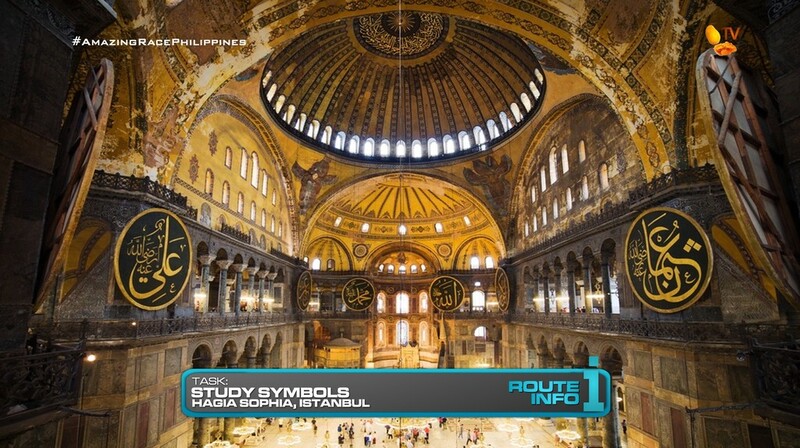 That clue directs teams to study the symbols inside of the Hagia Sofia. They must then descend into the Basilica Cistern and look in the water for two of the symbols which they can exchange for their next clue. BUT! 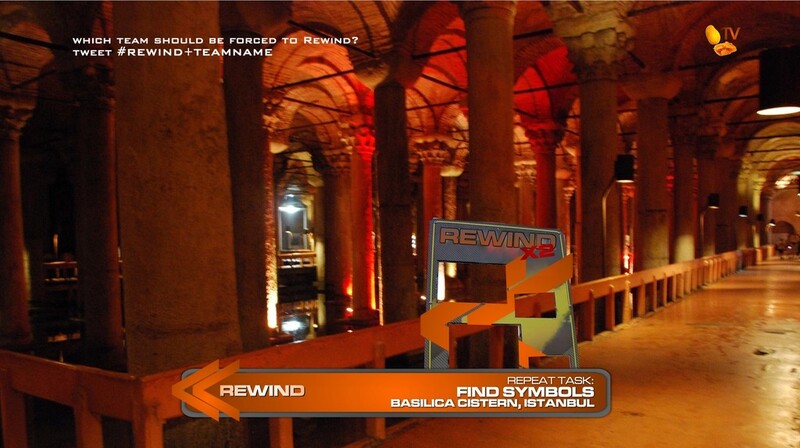 Before teams can leave the Basilica Cistern, they must check in at the Double Rewind board where they can force another team to repeat this task. Afterwards, teams must take a taxi to Rumelihisari. Here, teams will find a Double Road Block! Who goes up? And who goes down? 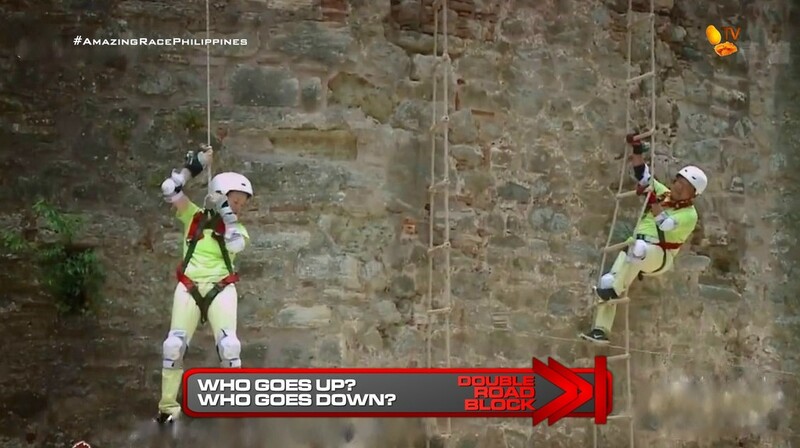 For this Double Road Block, one team member (Who goes up?) must climb a rope ladder 33m to the top to retrieve a flag. Meanwhile, the other team member (Who goes down?) will slowly be lowered down to the water and will be dropped into the water if their teammate cannot reach the top within six minutes. If teams fail the Double Road Block, they will receive an Automatic U-Turn! The next clue reveals that Detour: Put It On My Head or Put It On a Cone. For both Detours, teams must make their way to Istiklal Avenue. 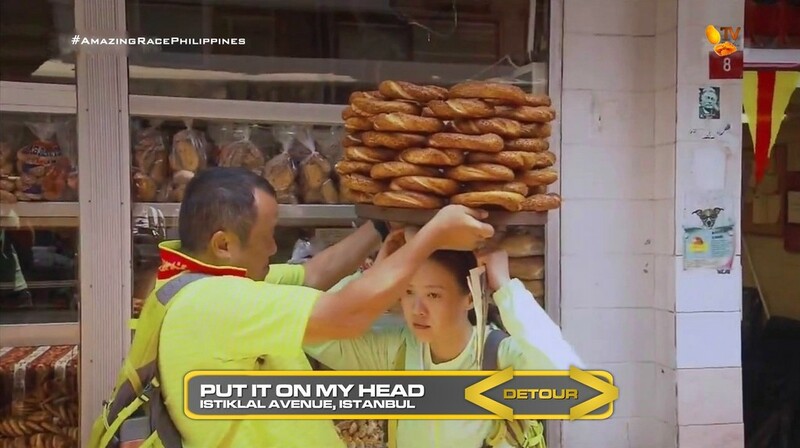 In Put It On My Head, teams must deliver three orders of traditional Turkish bagels known as simits to three different restaurants. Teams must stack 100 simits carefully on a delivery tray which both team members must balance on their heads. If any simit is dropped, they must head back to the bakery to start over. Once they’ve gotten stamps from all three restaurants, they can receive their next clue. 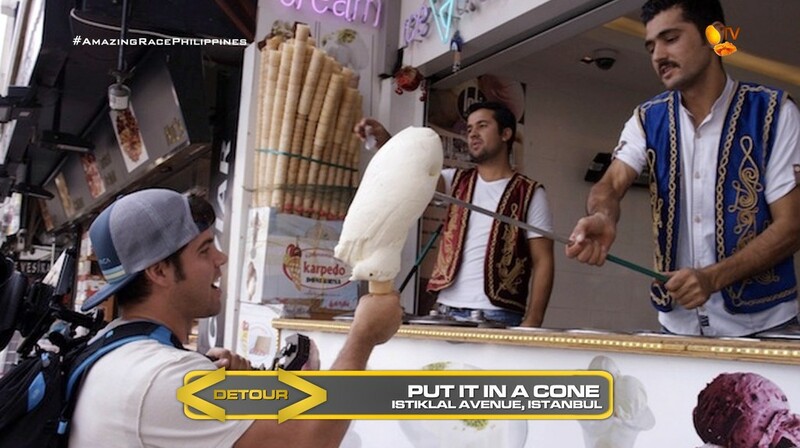 In Put It On a Cone, teams must learn how to serve traditional Turkish Maras ice cream which includes teasing performances. Once teams have memorized the routine and sold 40 Turkish lira worth of ice cream, they will receive the next clue. 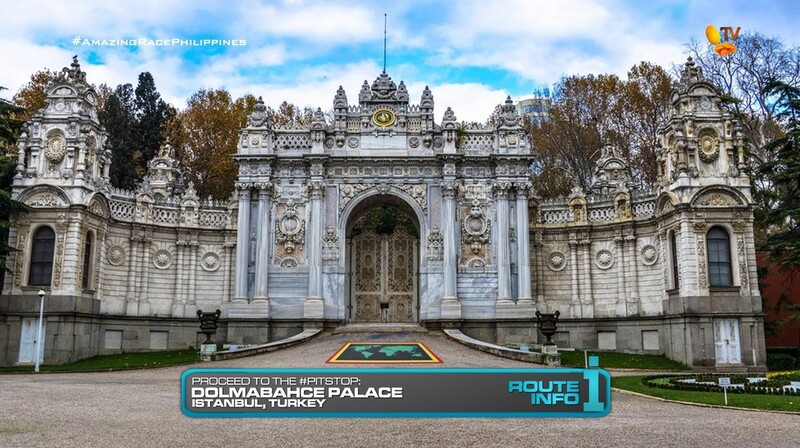 And that clue directs team to the Pit Stop, the Gate of the Treasury at Dolmabahce Palace. Not the first time TAR has visited Istanbul. So all of these tasks are basically recycled from various TARs. And slightly modified of course. 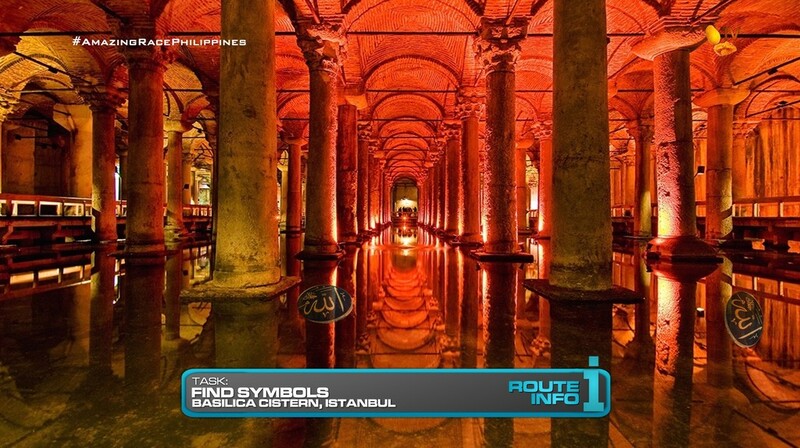 The Turkish bath Route Marker is always fun and interesting. For one, it provides a gratuitous skin opportunity with teams rubbing and washing each other. (Hello MTRCB!) And of course, it’ll be hilarious. I like TAR China 2’s version of the bathhouse task. The clue inside the soap bar is more creative than the TAR21 or TARAu2 versions. The Hagia Sofia is a must-visit of course. This is a modified version of TARAu2’s Road Block in which teams had to memorize ALL the symbols and put them in order on a column. TARPH already recycled that task in the final Leg of TARPH2 (the real one! lol). So this is different in that teams will just need to jump in the cistern water to find two of the symbols to exchange for the next clue. Should be a simple task and good as an extra Active Route Info task this Leg. I originally had this Double Road Block last in the Leg with a time penalty. But I thought that would be horrible right before the Pit Stop. So instead, I shifted it here and made the penalty a U-Turn. Quite possibly, NONE of the teams might finish this task. So all teams will be U-Turned. Recycled from TAR China 2, I thought it was a good, physical task. And TARPH teams definitely need lots of physical tasks. I made this a Double Road Block just to have both team members choose which part of the task they should do. The Detour is straightforward. The simits task done in TAR21 and TAR China 2 is also another one that should provide some fun. And the ice cream is a selling task which this season has not had yet. So, overall, I think this should be a solid, good Istanbul Leg.